While away training with a mysterious covert ops group known as the Sisters of the Hood, Red (Hayden Panettiere) gets an urgent call from Nicky Flippers (David Ogden Stiers), head of the top-secret Happily Ever After Agency. A wicked witch (Joan Cusack) has kidnapped Hansel (Bill Hader) and Gretel (Amy Poehler), and Red's the only one who can save them. Accompanied by Wolf (Patrick Warburton) and Wolf's pal, Twitchy (Cory Edwards), Red sets out to bring the children back. Download Hoodwinked Too! Hood vs Evil in Digital HD from the iTunes store. Hoodwinked Too! Hood vs Evil images are © Weinstein Company, The. All Rights Reserved. Back in 2006, an intelligent animated film entitled, Hoodwinked! was unleashed on unsuspecting audiences! The film provided a twist on the tale of Little Red Riding Hood, and told the story from many different character perspectives. Now after years of waiting (and lawsuits as well), Hoodwinked Too! Hood vs. Evil is coming to audiences. Hoodwinked Too! Hood vs. Evil takes place and a little while after the first film ending having Wolf, Twitchy, Red, and Grandma now working for the Happily Ever After agency under supervisor Nicky Flippers. While Red is away at a "super-secret", training facility, the ultimate caper is launched in which Granny Pucket is kidnapped, and Wolf and Twitchy are out floundering around without Red's presence. While Hoodwinked! was never known for its fantastic computer animated graphics, the story was where it really packed its punch. This time around the original writers from Hoodwinked!, Cory Edwards, Todd Edwards, are back for the sequel; but directing of the film is now in the hands of first-time, feature-length film Director, Mike Disa. With this new team in place, Hoodwinked Too! shows glimpses' of its former glory, but it is a far distant second to the brilliance of Hoodwinked!. Although the original story was circular and fully worked out so the tales overlapped each other smartly, Hoodwinked Too! Hood vs. Evil's story is a linear tale that doesn't have much consistency in terms of story. The overall plot is well defined, and it seems like the filmmakers just filled in the dialog and motivation for the characters on the fly. Voice casting also went a bit of a change from Hoodwinked to the sequel as well. Gone are the voices of Anne Hathaway as Red, and Jim Belushi as the Woodsman; they are replaced by "Hero's Cheerleader" and Martin Short respectively. While both do an adequate job at their roles, Hathaway's voice is dearly missed; and it is curious why both did not return for the sequel. While the original Hoodwinked! 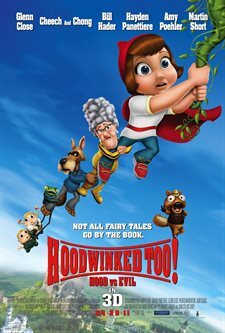 was a clever film that screamed to have a sequel made, Hoodwinked Too! Hood vs. Evil is just a run-of-the-mill by the numbers continuation of the story that does not necessarily add anything to the franchise.